Rrp £24.99 if you can get one! This ‘aint a book – This is an ancient document passed down from the gods! Well this is standard format manual its paper back and just short of A4 in height. It contains 448 pages with some photos but mainly exploded diagrams, all in black and white. The paper is a real nice quality, bound well and looks the part! 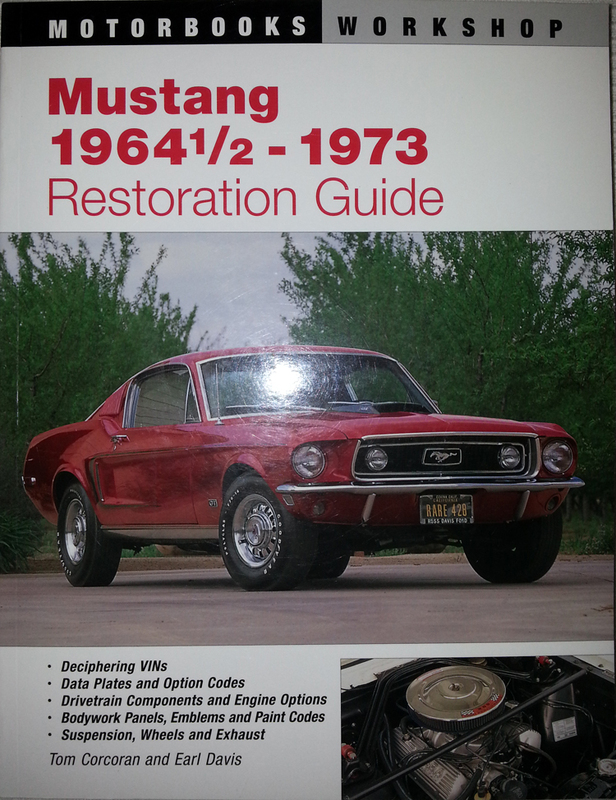 There are 9 chapters in all, 1) Data Plates and Decals, 2) Exterior, 3) Interior, 4) Engine, 5) Drivetrain, 6) Suspension, Brakes, Steering, Wheels & Exhaust, 7) Wiring & Electrical Systems, 8) Options, 9) 1971 – 1973 Mustangs. Followed by the Index. The photos in the book are mainly used to show differences in the cars and specs. But where this really comes into play are the diagrams. These are for each section such as, getting the spare wheel in the trunk, the centre console connections and fittings, where the dash fits, where the steering column connections go, what configuration exhaust pipes were fitted etc . The diagrams are labeled with the part numbers that’s every screw, nut & connection there is! I love this book and its my favourite manual of my expanding collection to date. Ok, there is not a huge amount of instructions on how to do things, in fact its sparse to be fair. However, the diagrams show where everything is in relation to each other if that makes sense. The exploded diagrams can get a little tricky to follow when the section is very busy such as the Transmission valve, where the diagrams are a quarter of a page but could be bigger to make it clearer. Study the diagrams for what you want and you will be rewarded. The numbers listed for the parts are just that, you will still need to know what you are trying to buy as a replacement though. Where you have things like how to remove and replace the light clusters these are easy to follow and a trained chimp could follow the diagrams. The sections flow well through the book, outside to inside, power to transmission, wheels to wiring and then the pretty bits to make it look nice. The book does not go down the route of , take this off, sand it down prime with this etc. as that information can be found anywhere in any restoration magazine. This deals with what you should have and where it is. Downside? Not many, perhaps people can’t get on with the style of this book being diagrams and not words of a descriptive nature. For me – its brilliant. Buy it. This is a superb reference book for the early Mustangs, The book is massive, covers everything, from taking anything apart to where did the decals go on the original car! This is a choice for most mechanics as they can see at a glance what will happen if you undo that bolt and what spring will try to poke you in the eye as a result of undoing that bolt. There are data tables galore in here that explain what stripes were applied to what colour of car, what springs for what engine size and transmission for that model of car. I do believe the data in here will give you more exacting information that the standard issue Haynes manuals. I don’t give out many perfect scores but this would have got the perfect 10 if some of the smaller diagrams were just that bit bigger. I’m not going to start dishing out half scores now though!